『신법천문도』는 조선 영조 18년(1742)에 관상감에서 황도 남북의 별자리를 그린 것으로, 높이 183㎝, 너비 451㎝이다. 보은 법주사 신법 천문도 병풍(報恩 法住寺 新法 天文圖 屛風)은 경종 3년(1723)에 중국에 와 있던 쾨글러(I.Koegler)가 작성한 300좌, 3,083성의 큰 별자리표를 김태서와 안국빈이 직접 배워서 그려온 별자리그림을 가지고 만든 것이다. 8폭 병풍으로 되어 있는 이 천문도는 제1폭에는 신법천문도설의 표제로 그 당시 천문학적 지식을 510자로 설명하고, 그 왼쪽에 태양과 달, 그리고 당시의 망원경으로 관측한 토성, 목성, 화성, 금성, 수성의 순으로 5개의 행성을 크기와 색깔을 달리해서 그렸다. 제 2, 3, 4폭에는 직경 165㎝의 큰 원이 3중으로 그려져 있고, 360등본의 눈금띠가 매겨져 있다. 이 큰 원의 중심에 황극(黃極)이 있기 때문에 큰 원은 곧 황도이다. 제5, 6, 7폭은 위의 세 폭과 같은 양식으로 황도의 남극을 중심으로 남쪽 하늘의 별들을 수록하고 있다. 제8폭에는 이 천문도 제작에 관여한 관원들의 이름이 수록되어 있다. 이 천문도가 언제, 어떤 경위로 법주사에 보존되고 있는지 그 경위는 알려져 있지 않다. 그러나 법주사의『신법천문도병풍』은 현재까지 알려진 쾨글러의 천문도 중에서 가장 크고 훌륭한 사본으로 귀중한 유물로 평가되어진다. 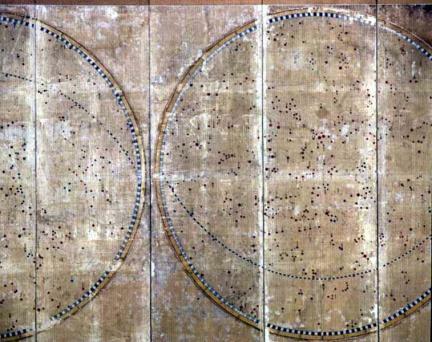 These charts of the stars to the north and south of the ecliptic were made by Gwansanggam (Bureau of Astronomy) in 1742, the 18th year of the reign of King Yeongjo (1724-76) of the Joseon Dynasty. They were based on charts made by Kim Tae-seo and An Guk-bin. 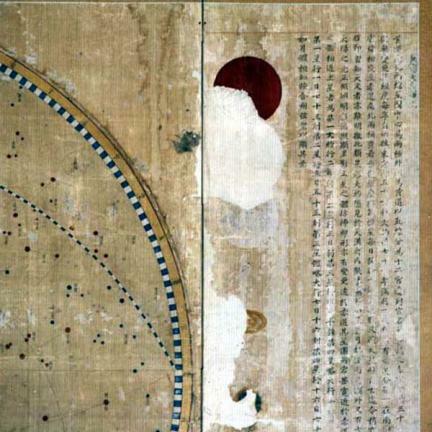 These scholars had learned astronomy from Koegler, a Western astronomer who had earlier made charts of 3,083 stars and some 300 constellations while visiting China in 1723, the third year of King Gyeongjong’s reign. This planisphere is composed of eight discs. On the first disc there is a depiction of then-known astronomic information with 510 letters, and pictures in size order of five planets, Saturn, Jupiter, Mars, Venus and Mercury. On the second, third and fourth discs, there are threefold 165 cm diameter circles. One of the discs is a chart of the stars around the ecliptic north pole and the other is a chart of those around the ecliptic south pole. 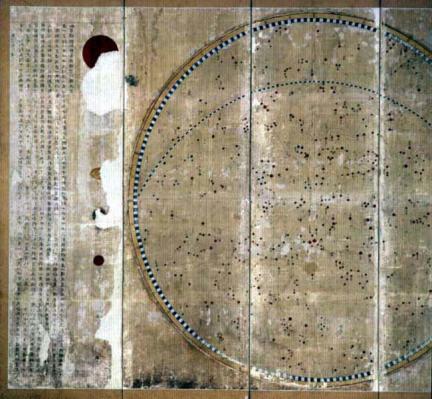 They are two of the best and most extensive star charts made under the influence of western astronomy. The names of the government officials who participated in making this planisphere are recorded on the eighth disc. It is not certain why or when this planisphere was placed in Beopjusa Temple, but it has been deemed a valuable heritage since it is known to be the largest and most excellent manuscript of Koegler's extant.